In our first rehearsal yesterday of Dohnanyi’s op.26 Piano Quintet, Juliette, who was unfamiliar with the work, remarked on how nostalgic it seemed. Meh, more like middle period. He was 37. But I understood what she meant. There is a sweet familiarity in some of the quintet’s themes, a reflective longing or melancholy in others, and times where they all come together in intense culmination. What’s interesting is these turbulent climaxes of thematic “memories” often result in something startlingly beautiful, as if reliving all of your life’s pain brings you rebirth and hope. The best example of this is in the last third of the first movement, where at the highest point of dramatic intensity there is an abrupt change from what had been a furious C minor to an ethereal C major. The quintet’s retrospective feeling makes more sense if you consider that the composition date of this quintet lined up with the start of World War I. 1914 also marked two major life changes for Dohnanyi: the start of a passionate affair with German actress Elza Galafrés, and a move back to his home country after teaching in Berlin for 10 years. Any of those circumstances could have led to powerful reflection and emotions in him. (There’s a particular passage in the very last climax of the piece, where the first violin climbs up into the stratosphere with such tremendous longing, while the piano is rolling in huge chords underneath. Its in the last two minutes of the pieces. When it gets big, watch Teresa. It’s GORGEOUS). Whereas his first quintet was a prodigious feat of teenage brilliance, (seriously…he was only 18, yet the composition was so good it won the admiration of the ever curmudgeonly Brahms), the second quintet is one of taut, masterful construction. It is surprisingly beautiful, surprisingly because once you hear it, you wonder why it’s not played more often. While a formidable pianist (he toured at the start of the 1900s as one of the greatest virtuosi of his time, performing all of Beethoven’s piano works in one season, and all 27 of Mozart’s piano concerti in another), Dohnanyi stood out for his choice to always perform chamber music in addition to solo concerts. And his writing in his E-flat piano quintet reflects a seasoned mastery of piano and string writing, creating a vast variety of textures through his smart treatment of each instrument. He was a brilliant conductor, and brought the University Symphony at Florida State to inspiring heights. 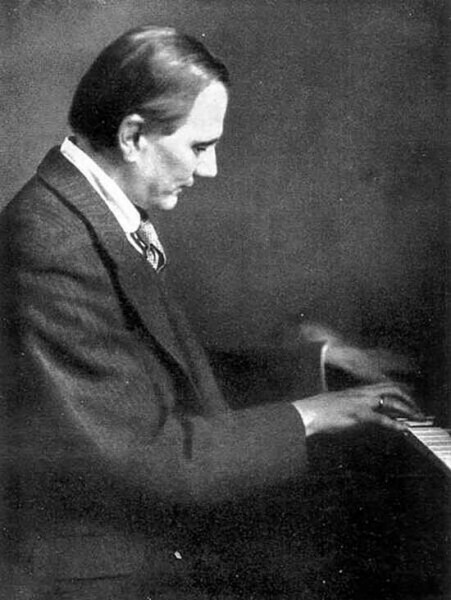 He recorded numerous albums of piano pieces in New York, and published three volumes of Daily Finger Exercises for the Advanced Pianist through Mills Music (I have not read these. I think I’m a little scared to). Oh, and he even became part of a frat! In 1948, he was inducted as an honorary member of the Epsilon Iota Chapter of Phi Mu Alpha Sinfonia Fraternity at the Florida State University. Here is a story of someone who was fully embraced in America and as a result, brought it so much artistically as a performer, composer, and educator. Ernő Dohnányi’s second piano quintet will be performed alongside Rachmaninoff’s great cello sonata on Thanksgiving day at Garth Newel, at 4pm. It’s a concert I’m excitedly anticipating, and one I hope you are too. Join us on the 24th to discover this work and to enjoy an amazing meal of Roasted Turkey Breast with Herb Gravy, Honey and Orange Roasted Ham, Roasted Asparagus with Shaved Manchego Cheese and Pine Nuts, Rainbow Fingerling Potatoes with Feta and Butternut Squash, Pesto Whipped Potatoes, Cranberry Sauce with Apricots, Apples and Sun-dried Cherries, and Various Sides and Desserts.